Today’s children are growing up in an era of rapidly growing technology, shrinking backyards, and playgrounds that put safety (of course that’s important!) over exploration. Today’s families are busy, busier than they ever have been! Eating one meal a week together anymore is a luxury, and I’ll bet while you are sitting together around the table, at least one cell phone is out and one person is thinking 10 steps ahead to what needs to get done next. One thing that has not changed is that we all still want what is best for our children to grow into well-adjusted, happy and productive people. Just Children Hilltown strives to do what’s best for the smiling faces that we see every day. Educators and families need to understand the importance of play for young children and to respect it as the primary way children learn real-life skills that can be applied in all learning environments. Research has shown time and time again that children learn best when engaged in whole-body experiences, and these experiences occur most optimally in the context of play. Everyone’s favorite pediatrician, the world-renowned Dr. Benjamin Spock, tells that children love their play, not because it’s easy, but because it’s hard. Children apply knowledge and skills to new situations constantly, and when they do it through play-based activities of their choosing it is more meaningful and longer lasting. When our staff here at Just Children Hilltown thinks of play, they think of it as an opportunity to extend a child’s learning. Through careful observation and reflection, they can create guided learning opportunities to meet critical developmental goals that align with state early learning standards. We look at what the child knows, consider what we need them to learn next, and plan specific opportunities to get them to that next level of development. 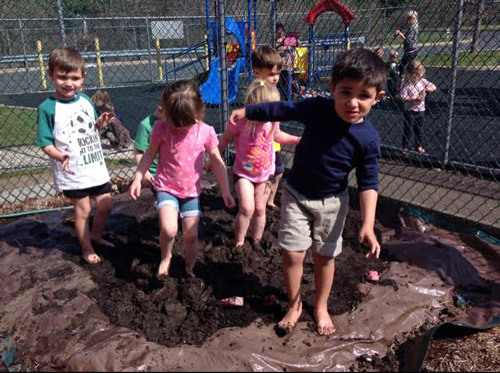 Seemingly simple play activities involve so much more than just recreation. When children are playing with blocks or exploring with sticks, leaves, and rocks, they are engaged in scientific processes of cause and effect, problem-solving, social collaboration, spatial reasoning, geometric patterns…. The list goes on and on. When we release children to openly play and explore a natural outdoor environment or open-ended play based rooms, we are freeing them to develop critical thinking skills that will take them further than simply being able to memorize and recall information. We are equipping them to be the new creators of information that could lead to the solution for pollution, a cure for the Zika virus, or even how to develop an economy that really works for everyone! Please don’t look at a child’s report card, worksheet, or the ability to navigate the latest learning app as a true reflection of what your child is capable of. Watch them play, listen to what they say, and better yet, think about what they aren’t saying, but what they are showing you about how smart they really are. Let them play! We must always preserve and protect a child’s right to play. Always remember, Just Children encourages parent feedback when at all possible, so please feel free to write, call, find us on social media, or stop in and say hi!